HOUSTON – (Nov. 16, 2016) – The Master of Business Administration program at Rice University’s Jones Graduate School of Business is ranked No. 8 (up from No. 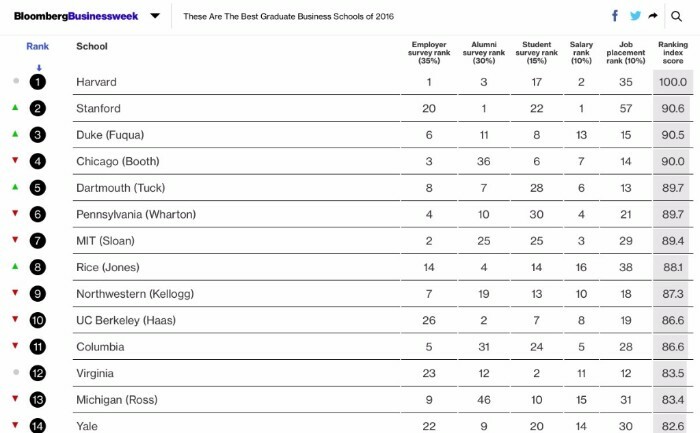 19 in 2015) in Bloomberg Businessweek’s new analysis of the best full-time MBA programs in the nation. This marks the MBA program’s first top 10 ranking. The designation places Rice Business among the nation’s most distinguished business schools, including those at Harvard, Stanford, Duke, Chicago, Dartmouth, Pennsylvania and MIT. The rankings include 87 full-time U.S. schools. To determine which business schools offer the strongest education and best prepare MBAs for their careers, Bloomberg Businessweek ranked the full-time MBA programs on five measures: a survey of employers who hire the school’s graduates (35 percent of the ranking); a survey of program alumni satisfaction (30 percent); a survey of current student satisfaction (15 percent); the Class of 2015 placement rate three months after graduation (10 percent); and the starting compensation for the Class of 2015 (10 percent). The biggest contributor to Rice Business’s rise in the overall full-time ranking was the positive assessment by employers, current students and alumni; alumni ranked the program No. 4 and employers and students ranked it No. 14. Rice’s full-time MBA program gives students a comprehensive learning experience that mixes specialized coursework and real-world experience. The program features innovative classes, expert faculty and diverse classmates who become lifetime colleagues. Rice Business is consistently recognized by several rankings publications for its programs, including the Rice MBA, Rice MBA for Executives and Rice MBA for Professionals. The school is internationally known for the research and thought leadership of its faculty. For more information on Rice MBA programs, visit http://business.rice.edu. To view the complete Bloomberg Businessweek rankings and methodology information, visit http://Bloomberg.com/bestbschools2016.